TDS WHO VOTED against their parties on the Protection of Life during Pregnancy Bill face varying degrees of punishment from their party with Lucinda Creighton set to be de-selected as a Fine Gael candidate at the next general election. The former junior minister’s decision to oppose the government on the abortion legislation means she has automatically resigned from the Fine Gael parliamentary party. Having also resigned and already been replaced as Minister for European Affairs she must now contend with a battle to keep her Fine Gael affiliation in order to run at the next general election which will take place in 2016 at the latest. A Fine Gael spokesperson told TheJournal.ie this week that members who submit themselves for nomination would need to have the approval of the local constituency organisation and the party’s national executive – making Creighton’s chances of running for the party again remote. The spokesperson said that any prospective candidate would “be expected to be [a] member in good standing” and pointed out that their selection would be “subject to approval by the [Fine Gael] National Executive”. Taoiseach Enda Kenny suggested this week that it would be unlikely someone outside of the party whip would be selected as a candidate for the party at the next general election. A similar fate to hers has already hit Peter Mathews, Terence Flanagan, Brian Walsh, and Billy Timmins, who all voted against the legislation at second stage last week, losing the party whip, their committee memberships and their Leinster House offices in the process. Creighton also faces losing her office in the Fine Gael wing of Leinster House and will be relocated to an alternative office. Her seat and those of her four colleagues in the Dáil chamber are also likely to be moved to the backbenches. One source close to the former minister suggested there is a way back for her, but much depends on how she “plays it” in the next few years. “If her votes are with the government, it keeps her near the fold,” the source said. Meanwhile, Sinn Féin Peader Tóibín’s suspension from the party for six months means he loses his portfolio as spokesperson on jobs and enterprise. A party spokesperson also confirmed that Tóibín cannot attend party functions and has lost all voting rights in the party but he will remain in the Sinn Féin wing of Leinster House. “People will be cordial, he’s still on our wing, he’s been here all the way through. People have been polite, there isn’t hostility but it’s tough enough at the same time,” the Sinn Féin spokesperson added. Email “Lucinda Creighton is unlikely to be chosen as a Fine Gael candidate again”. 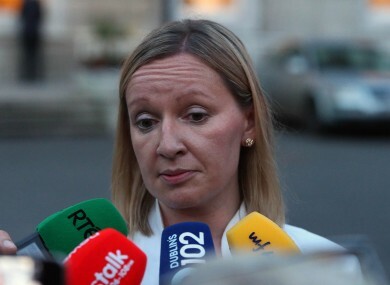 Feedback on “Lucinda Creighton is unlikely to be chosen as a Fine Gael candidate again”.